They’ve got the urge for going, and they’ve got the wings to go. Vaguely aware of dusk approaching, I was sitting at the kitchen counter grading homework assignments. Normally, I don’t like to stop in the middle of a paper but I heard a clarion call that made me bolt for the door without a second thought—the rasping two-note hank-honk, hank-honk of Canada geese. For me, this sound is the very essence of autumn and wanderlust, and I responded instinctively. My disappointment at not being able to sprout feathers and tag along was tempered by the fact that I could tell this particular flock wasn’t going very far. They were resident geese, a relatively new concept that refers to birds that hang around all year long rather than migrate with the changing seasons. The urge for going, it seems, does not reside in the heart of every Canada goose. Scientists used to think migration was an undeniable impulse. This idea gained strength following experiments in which some species of wild birds were raised in captivity under circumstances that prevented them from experiencing environmental signals, yet they continued to behave like their uncaged brethren. For example, when allowed to fly they demonstrated a preference for the same direction as the migratory path their conspecifics in the wild were navigating. The urge for going is strong among many birds, including warblers and vireos, northern pintails and blue-winged teals. 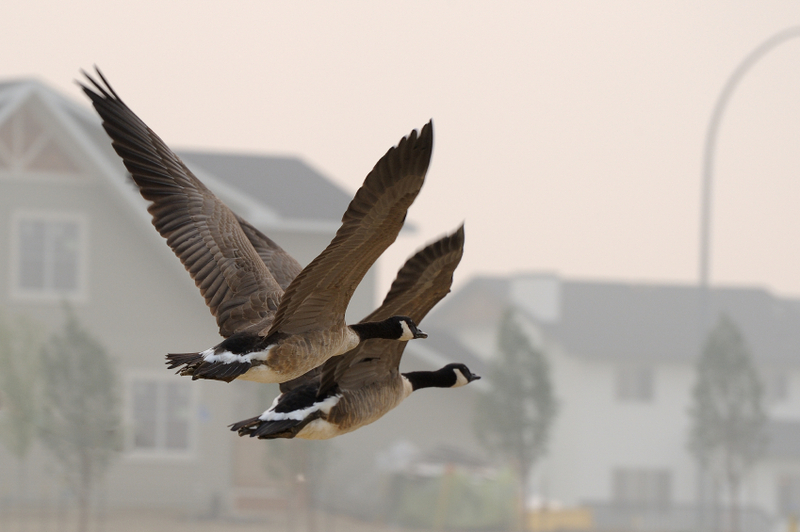 Canada geese, however, seem able to take migration or leave it, at least those living in the burgs and ‘burbs. Goose (voiced by Betty White): Dear, I’ve been thinking… wouldn’t it be nice to skip the move down south and just stay put this year? Gander (voiced by Robert Duvall): Now, Mother, what’s gotten into that feathered head of yours? We can’t just skip migration! It’s a tradition in our family that goes back more generations that anyone can count! What would the rest of the flock say?! Goose: Some of the flock did stay behind last year, you know, and it worked out just fine. Travel is so metabolically expensive… maybe it would be smart to consider a staycation. Just think about it. That’s all I ask. One feature of the urban landscape that makes winter survival easier for resident geese, even in northern states, is the heat island effect. Cities have a lot of thermal mass. According to the U.S. EPA, evening temperature differences can be as large as 22°F (12°C). That means lakes and ponds freeze over less often—an appealing feature for waterfowl. And the food supply at a park or on a golf course is plentiful year-round. When faced with the question, “should I stay or should I go?” more and more geese are choosing to stay. And why not? How did I know the geese winging past my door were year-round neighbors? Migrating geese can be seen flying high and fast unless they’re heading down to rest and refuel. My geese were flying low and slow, gaining altitude only when necessary to avoid colliding with power lines and apartment buildings. Knowing I’d see them again if I keep my ears open, I bid them goodnight, said hello to the nearly full moon, and stepped back inside to grade… and dream of flight. Have a question about wildlife and other next-door nature? Send me an email and the answer may turn up as a future blog post. And don’t forget to friend NDN on Facebook! © 2010 Next-Door Nature — no reprints without written permission from the author. This entry was posted in behavior, birds, Canada geese, Habitat, migration behavior and tagged Bird, Canada Goose, Flora and Fauna, migration behavior, Nature, Northern Pintail, urban, Urban Ecotourism, watchable wildlife, wildlife by Kieran Lindsey. Bookmark the permalink. Great site! Education is key to creating a greater awareness of the wildlife we share the world with.